A year or two ago I requested and received some church records written in the late 1800s in German. The handwriting was completely indecipherable to me! I trusted that they were the records of my ancestors because the church historian who had searched the church ledgers knew the old German handwriting and assured me that they were for my ancestors. It wasn't enough, though. I wanted to know for myself what the handwriting said, so I looked for websites where I could learn Old German handwriting. I realized that there are two problems with Old German documents. The first is that the German and English alphabets are not exactly the same so I had to learn a few new letters in order to translate from Old German to English. Second, I still couldn't read the words until I translated the German words to English. Double work! Depending on the age of the documents, you may need to translate from Fraktur, Sütterlin/Suetterlin, or Kurrent. 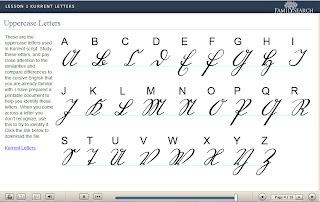 It will be fairly easy to determine which handwriting was used if you compare the letters on your document to the letters from each style of writing. One of the resources I found very helpful was a lecture hand-out by Sabine Schleichert called "How to Cope With That Old German Script" from German Genealogical Research Service. Because this hand-out has a copyright, I give you only the link. I found it especially helpful because it has a chart with letters in English, Fraktur, Kurrent, and Sütterlin. It also has the signs for days of the week as well as a chart for German symbols and words of genealogical use, such as birth, baptism, marriage, etc. The German Genealogical Research Service may be a helpful website to you if you have German immigrant ancestors because of the links available there. The image at the top of this post is Sütterlin from a website called Suetterlinschrift. You can see that some of the letters are similar to their English or modern German counterparts but others look nothing like our modern letters. I found that I either needed to practice till I recognized certain words or use a chart like this one and translate letter by letter. 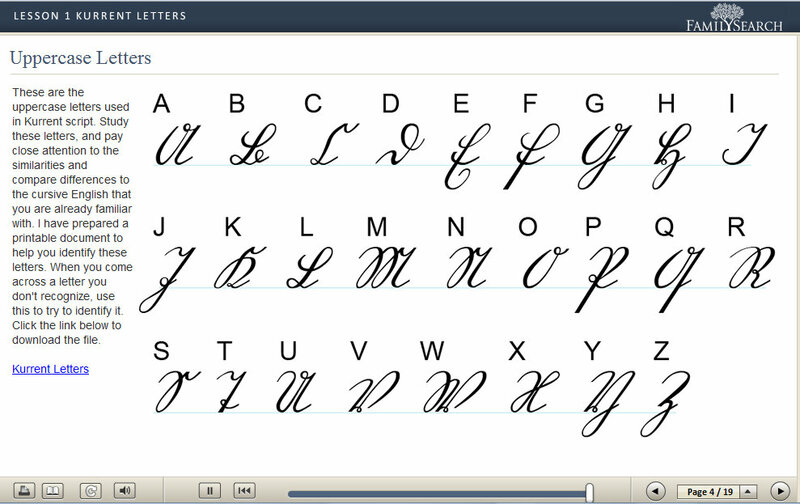 At this website, write your name in Suetterlin, you can use a keypad to type letters which will appear as handwriting. Consider writing not just your name, but other words to compare them with words in a handwritten document or to try to decipher the document. 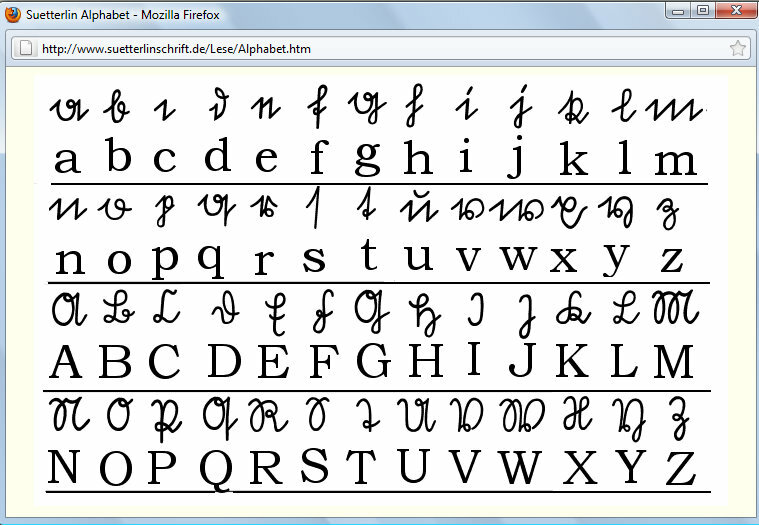 Another site I found useful was German Script Alphabet which looks like Suetterlin and shows the letters in handwriting and in print. While the digitization of this page is not exceptional, the information is very helpful. You will be surprised at how different the printed and handwritten versions of the letters look. 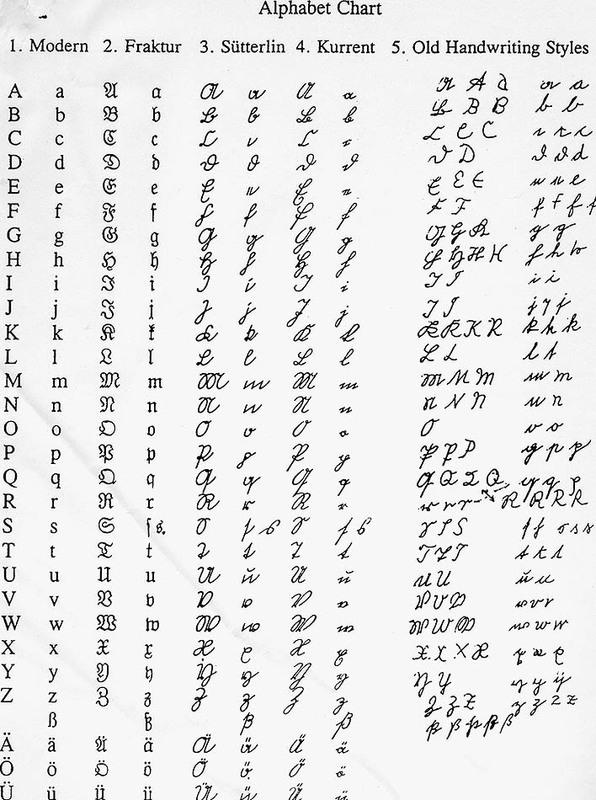 This Alphabet Chart includes modern, Fraktur, Sütterlin, and Kurrent as well as several handwritten examples for each of the letters. You know how handwriting varies from one person to another, right? We all generally recognize a variety of handwriting but when translating it from another language, it's sometimes hard to tell for sure which letter is which. This excellent chart helps with that. Again, you might be surprised at how differently people wrote the same letters. Handwriting Guide: German Gothic is an excellent resource guide from the Family History Library. It covers old German type and handwriting and includes a chart showing Roman type, German type, and German script. 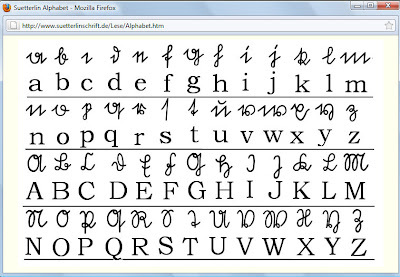 If you happen to be interested in having a True Type Font of Fraktur letters, here you go! Have some fun. This site includes a few paragraphs of lessons about the alphabet and some specific letters as well as how to type the vowels with umlauts using the number keypad. Beolingus is a translation site. If you can translate the Old German alphabet into modern letters, you can use this site to translate from German to English and vice versa. Finally, among the FamilySearch Research Courses is a series of interactive lessons on Kurrent handwriting which include handouts that you can print. The great thing about these lessons is that no matter what kind of learner you are, aural, visual, interactive, etc., that method is included in these lessons. They are presented by a lady with a beautiful German accent who invites you to do on-screen activities. When you get to the site, be sure to scroll down till you get to "Reading Handwritten Records Series" and then look for the three German Kurrent lessons. If you're translating Old German handwriting, I wish you all the best. You will feel like you've really accomplished something by the time you're finished! Please also be sure to read Katherine's post of April 5, 2016, Ten Tips for Deciphering Old German Handwriting, at SK Translations. She shares some specific and helpful ways to identify differences in letters that look similar. If you're translating Old German typefaces, Helps for Translating the Old German Typeface may be helpful to you. © 2011-2016 Copyright by Nancy Messier. All rights reserved. Great post Nancy. Half of my records are written in the German Script. My grandparents are in the "Gothic" style and the Bohemians are in the Sutterlin.. It had me confused for a long time because I was looking for Sperl and what I was reading looked like Operl. I have a friend that wants to have his grandmother's handwritten cookbooks translated- at least some of the recipes. He has made several attempts throughout the years with no success. I really want to help with this, From this blog, it seems my first step would be to see which script it is. Is there anyone willing to look at a picture of a page and see if they can help?? Susan, if you have a Facebook account you could try Genealogy Translations (https://www.facebook.com/groups/genealogytranslation/) or you could check at SK Translations (http://sktranslations.com/) for helpful blog posts or contact Katherine, herself, the blog owner. Good luck! Thanks--I've bookmarked this post. I'm not to the point where I'm working with German records, but I know it's coming and this will be invaluable. Great information, I'm fairly comfortable with my German, but not with German script. Thanks! Thanks for this list of resources. I have alot of German ancestry on my mother's side and I've been putting off delving into the records. This will really help! "Write your name in Suetterlin." Claudia, I know just what you mean - what you see looks so different from what it really is. Anonymous, (or if there are two different ones, to both of you)-- Thanks so much for adding these links. The second one could be very helpful with words other than names, too. I appreciation your additions. I'll second the Moravian recommendation - their archivists gave a half-day intro to Fraktur at a recent archivists conference, and it was very useful. I'm sure the full-week course would be invaluable. Hi there, I have some german silver cutlery that seemed to belong to a Baron around late 1800's. The set is now in Australia with my family but I wish to find its rightful owner. I would like to send a photo of the inscription, as I cannot figure out what the initals are. How am I able to do this? Any help would be great! Thank you. Great post! I work with old German script on a regular basis, so I greatly appreciate any sites on handwriting tips and information. If anyone needs any German genealogy translation services, my site is http://sktranslations.com/. I'd be happy to help you. This post has saved me--thanks so much! I'm glad it could be of help to you, Alison. I don't think it matters what handwriting you're trying to transcribe, Michelle, if it comes from decades ago, it's nearly all hard to read and transcribe. I think the challenge with German is that it's a foreign language so we're seeing writing that doesn't form into words we know. Handwriting in old documents is just plain challenging. I have death records which have 2 letters separate at the end along with 2 numbers. What do these mean. I read modern German fairly well, but find Gothic German really slow going. Is there an program that "translates" one to the other? Translating is never the problem, nor is the Fraktur - it is the cursive writing that always challenges. Transliterating is the tough part. I recently had to tell someone that what they thought was a wedding certificate was actually an inquest report, sadly. Thanks for sharing your thoughts, Anonymous. German is so difficult for me that I lump all aspects of translating together. How sad for someone to learn that their document was an inquest and not a wedding certificate! Hi, Frank. Katherine at SK Translations (http://sktranslations.com/) translates. Or, if you're on Facebook, you could join one of the genealogy translation groups and post there. They're a very generous bunch of people. Hope you find someone.